What went down at TUC Conference? It was the 150th anniversary Congress of the TUC this week, taking place in Manchester – right where it all started in 1868. Among the hundreds of speeches and dozens of fringes, here are some of the most significant things that happened. 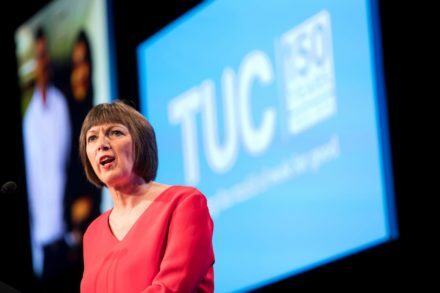 A statement by the TUC’s general council was voted through by Congress that shifted its position on Brexit, though it’s not as straightforward as much of the press has reported. Calling unions to take action against a Brexit used to attack workers’ rights, it demands MPs call a general election if no deal is made at all. In the event of a Labour government, the statement calls for an extension to Article 50 to allow us to negotiate a deal ‘for the many’. And if that cannot be achieved, TUC will demand a vote on the details of the Brexit deal. Obviously any issue-based vote put to the public is technically a referendum, but many have been careful to avoid using ‘the R word’. This can be seen as a softening of the position on Brexit by some of the unions and a victory for the campaigning groups who have been pushing for a vote on the deal. John McDonnell said of Labour’s position of this in his speech: “it’s not off the table, but we would prefer a general election”. And on that speech: the latest policy announcement from the Shadow Chancellor on extending rights like sick pay and parental leave to people in the ‘gig economy’ was exactly what we needed. A fresh pledge that dominated news loops all day on Tuesday. Announced in a speech that meticulously listed Labour’s pro-worker policies, McDonnell promised “the biggest extension of individual collective rights our country has ever seen.” He also detailed the recently announced plans to give workers a direct stake in their company, a transformative proposal that has been developed with the support of the Co-operative Party. He went on to say, “all workers will have trade union rights from day one, whether they’re full time, part time, temporary or permanent”. The Shadow Chancellor said a Labour government would look to introduce online balloting for industrial votes, abolish employment tribunal fees, prioritise strengthening protections for women against unfair redundancies and banning payroll companies that top-slice workers’ pay. McDonnell’s speech, which received a standing ovation, can be seen in full here. It is an issue some expected to be contentious. In the Labour Party, we have seen the unfortunate tirades of trans-exclusionary so-called feminists over our all-women shortlists policy. But on the motion to support a government consultation on the Gender Recognition Act, there was overwhelming support from Congress. A reformed policy, if passed by parliament, could scrap the £140 fee required to obtain a Gender Recognition Certificate, de-medicalise recognition and instead allow self-identification for trans people – all now TUC policy. The motion heard by Congress also called for action to challenge “repressive gender stereotypes in the workplace”. Maria Exall of the CWU said in a speech: “Trans people should be able to live their lives with dignity and free from abuse.” There were no votes against the motion. The Church of England’s principal leader was invited as a keynote speaker at Congress. Echoing some of McDonnell’s sentiment the previous day, Justin Welby used the opportunity to call for tax reform, accusing companies like Amazon as “leaching off the taxpayer”. In an attack on Wonga, the recently-folded loan shark, Welby said he instead envisioned a world in which foodbanks, debt advice services and homeless shelters had to go out of business. The Archbishop also called for the rollout of Universal Credit to be stopped. This perhaps precedes a strengthening of Labour’s own position on the policy at party conference next week, where CLPs are expected to call for a stop and scrap position. An emergency motion proposed by the UCU was supported by a range of unions, calling for all trade unionists to join a march called by Stand Up To Racism on Saturday 17th November. The protest marks a change in pace – most demonstrations called in recent months have been counter-demos, responding to actions by the Football Lads Alliance and its various splinters. The November action will instead be a pro-active, assertive march to demonstrate the movement against racism. Earlier this week, Labour figures including John McDonnell and Diane Abbott and a dozen other MPs and MEPs signed a statement in support of the action. Just weeks after Labour’s NEC was urged by Palestinian trade unions to “protect the right to freedom of expression”, many of Labour’s affiliate unions made clear that Palestine will remain an international campaigning priority. On Wednesday the TUC debated a motion on the recent cutting of United Nations Relief and Works Agency (UNRWA) funding and Israel’s controversial Nation State Law, which was carried unanimously. In moving it, Mick Whelan, general secretary of ASLEF and a member of Labour’s NEC, declared the law “racist”. Other speakers called for UNRWA funding to be plugged by the UK government. The previous evening, UNISON’s vice-president Josie Bird reiterated the union’s support for the Boycott, Divestment and Sanctions (BDS) movement at a busy event organised by the Palestine Solidarity Campaign. In just a week and a half we’ll be conferencing again. Be sure to check out all the LabourList events that will be taking place at conference. Shelly Asquith is political advisor at Unite the Union and writes a LabourList column on industrial disputes.